Read about our partnership with midtown visionary Marva Ellard here. Meeting this year’s unique and difficult challenges has been supremely satisfying to our PAMBE Ghana family. Our goal has been to provide stability for our 278 students to continue their job of learning, growing, and mastering the elementary curriculum. Moyom (left) is in pre-K and started his studies this fall. He has every reason to think that he will start junior high in 2025. Jaliu (center), currently in grade 4, will graduate in 2021, and Hanna (right) is a 5th grader who will graduate 2020. Even when outside circumstances impose challenges, these children and their educations are always our priority. Your dollars work hard to give them this priceless gift. Please continue this support as you make your giving decisions this month. Ushering in a smooth leadership transition at LLC was perhaps the year’s biggest and most visible accomplishment. Fortunately, our team identified a person with the unique blend of skills and experience to assume the school’s leadership role and that of liaison with the OKC-based board. Eric Gumah began his tenure this summer and will work alongside me this entire school year before taking over in September 2019. 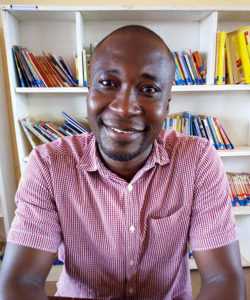 Eric has been closely involved with LLC in previous years as a Montessori trainer. The staff members know and respect him. This transition is momentous. Eric has begun a program of ongoing guidance, feedback, and continuing education to upper grade teachers in particular. Students are experiencing an enhanced selection and use of Montessori materials as their teachers grow in their own professional knowledge and skill base under Eric’s direction. Another major change this year involves the addition of a pilot junior high program for 7th graders. The children who attended junior high in Langbinsi reported negative experiences, which motivated their parents and LLC staff to intervene and consider alternatives. After much discussion with parents and teachers, it was decided to begin a 7th grade class at LLC for the graduating 6th graders. Since this is a test, prospective graduates don’t know if they’ll follow LLC’s first two graduating classes in Langbinsi or if the current pilot program for 7th graders at LLC will be an option. We are exploring many possibilities, including whether an LLC-based partnership with the Ghana Education Service is feasible. This uncertainty is truly difficult, but our goal is to offer our students the best prospects. As always, growth means increased expenses. Your support has opened the school doors to full classes of pre-K students for eleven years running. Your donations have helped expand LLC’s facility as more children make the daily walk from their home villages. Your gifts have helped populate their classrooms with learning tools: Montessori materials, early readers in their mother tongue of Mampruli, basics like pencils and papers, a solar powered computer lab, and a library that prepare these students for the future. Because of your donations, the children’s teachers are trained and bring to their classrooms a high quality learning experience. Successes this year include the doubling our endowment fund, a major expansion that doubles the size of our computer lab, and completion of a building that we now use as a temporary junior high. We are actively working to expand our revenue base, and have funded these and other projects with grants. However, what actually keeps this school in session, day after day, year after year, are gifts from supporters like you. Your donation will be matched by a grant from the Paul and Ann Milburn Fund of the Oklahoma City Community Foundation. Your gift will be doubled. 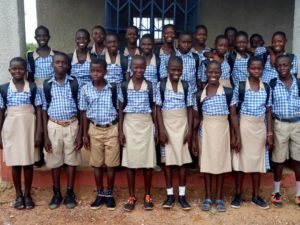 PAMBE Ghana’s numbers speak: 278 students in pre-K through grade 6, three classes of 6th grade graduates totaling 75 students. Each of these numbers is a child whose life we have touched, in a family whose life we have changed, in a community alongside which we work, even though we’re an ocean apart. Please give this year, and if possible, consider increasing your gift generously. In this place, your money works hard and does great work.